This week’s podcast scripts catch-up from Really Like This Book is a blissful swim through Kathleen Jamie’s book Findings. Like Robert Gibbings, she writes discursively, moving randomly but purposefully from one subject to another as the observations she’s making surface from her memory. Findings filled me a great desire to get on a boat to go whale watching, or climb hills looking for old settlements covered in grass and nettles. It’s not a book to inspire great thoughts and philosophy, it makes you want to do the things she describes. I want to press this book into every Christmas stocking I fill, and send it out as birthday presents. Findings is a book of chapters, written by a poet, about life. I would never buy a book from that description alone, but I bought this one when passing through a Scottish country town several years ago, because the cover shows you a big bird thermalling over sunlit Highland hills, the sort of hills I grew up walking when I was a sulky teenager. Nostalgia for the look of the hills drew the book and me to the cash desk together. Turn the book over: and there are the same hills, now surmounted with a blurb that speaks directly to me: ‘Between the laundry and the fetching kids from school, that’s how birds enter my life’. 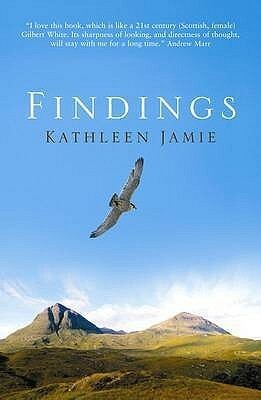 Kathleen Jamie’s life is richly populated with sparrow-hawks, corncrakes and dolphins. She goes to view the winter solstice on Orkney in the Maes Howe Viking mound. She goes to an old people’s home on Uig to see her granny, and travels to the ends of roads just to see what’s there. She avoids looking at a dead starling rotting on a roof while she’s waiting in hospital to see if her husband will survive a lung disease. She has a constant awareness of time running towards and past the time for fetching from school, and the making of meals. The domestic is patched in amongst the piercingly scientific. 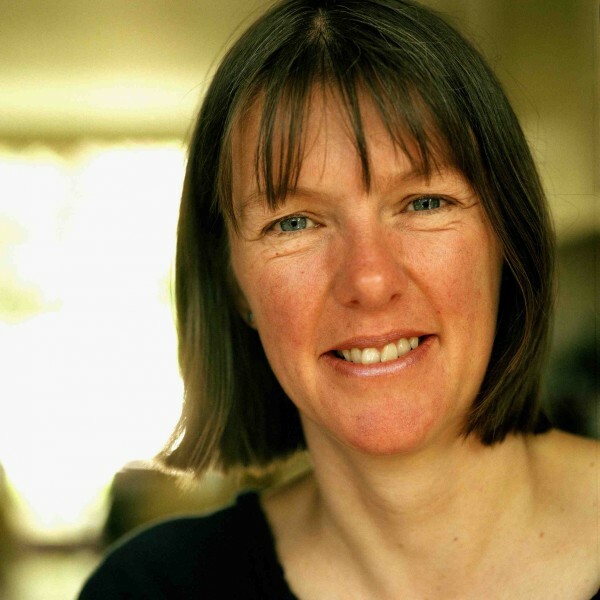 Kathleen Jamie is a travel writer as well as Professor of Poetry at the University of Stirling. She is the easiest of writers to read, and an impeccable judge of balance and tone. 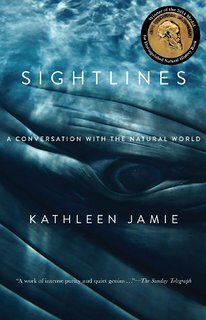 This book of bits and pieces from her life, all rooted in observations from natural history in the most ordinary of moments, shows that ordinariness reveals startling beauty, that anyone can see the truth, but that we will all feel tired from looking too long. The life she describes is domestic and small-scale, and very discreet. It’s about what she sees, and how things strike her, in the midst of concentration and worry and a feeling that this life is going a wee bit too fast, there’s going to be no-one left to pick up the slack. She’s a fortunate woman because she can find the time and space in an ordinary domestic routine to get away and think, and cycle, and walk. She’s usually on her own in the jaunts she describes: up a hill, overlooking a salmon-leap, or walking on a road. For a woman with a young family that is an immense and not altogether guiltless luxury: I envy her the clarity of mind to be able to take that time to be by herself. Her purpose is to investigate things, things that interest her, though we’re not told why, exactly, she goes to the Hebridean island of Coll to look for corncrakes with a bird protection warden, or to the Monach Isles to look for a gannet’s skull. It’s much more interesting what she does there, what she writes in her notebook. I so enjoy the amused resignation she feels when realising that she can’t read her own hand-writing, or that her tracing of a Pictish cup mark in a rock looks like nothing on earth but a fried egg. I don’t know why she’s in Surgeon’s Hall in Edinburgh, looking at bottled specimens, but I’m quite attracted by the idea of spotting an interesting wind-vane on the skyline, and then taking a telescope up a hill to have a good look over the city at all the other unseen weather-vanes and cockerels on the city roofs. All the things she does are things anyone could do, if we just planned a bit, and took the time. She’s a glutton for detail and seeing how other people act. She laughs at herself and she’s affectionate about the folk she meets. She thinks a great deal about dead people whose traces she finds in her own life, and she’s very closely attached to the live people in her life. When she invites us into her life through this book, we’re immediately taken out the back to be shown something interesting. Another of her books of essays, also tremendous. I’ll take you through a chapter of Findings, to show you the kind of writer Kathleen Jamie is. It’s called ‘Crex-Crex’, which is the noise a corncrake makes. I didn’t know about corncrakes at all till I read this book, but that’s not surprising because they hardly exist at all in the UK, only on Coll. The chapter starts with a description of Constable’s painting The Hay-Wain, which is on the wall in her Coll B&B. Out of the window she can see a red boat drawn up on the beach, and yellow irises. Coll is a tiny island, so you’re never far from the sound of the sea, and it’s a home for the corncrake, which John Constable would have heard freely in the Suffolk fields when he packed up his easel after finishing the Hay Wain, on the other side and end of Britain. On Coll, Saturday night is party night for courting corncrakes, so Kathleen goes corncrake counting with the RSPB warden. She has to drive the Land Rover over the wet sand of the foreshore fast enough to not sink. She thinks about the fact that John Clare, a poet from Constable country, was one of the very few people of his day to write about corncrakes because the bird was so common in the early nineteenth century. There are only 160 folk living on Coll. By 2am Kathleen and the warden have counted 73 courting male corncrakes. The warden counts lapwing nests too, ignoring the dive-bombing birds while she makes notes on her spreadsheet. By finding a way to live on Coll, the corncrake has become a Hebridean bird of beaches and windblown peatlands, successfully adapting from being a flatland and fenland bird of the English mainland. I wonder, has it changed its accent? Incoming English settlers to Scotland rarely manage to change their accents, unless they arrive very young and assimilate in school playgrounds. Incoming adults tend to use Scottish words self-consciously, sounding out of place, but once they’ve lived in Scotland long enough it doesn’t matter very much. Do the Coll corncrakes use inserted sounds from the natives? Kathleen meets an Englishman on holiday, who grabs a few hours of birdwatching while his young family are on the beach, because he really wants to see a corncrake. ‘They’re like the little gods of the field’, he admits, a little embarrassed. This is is a good way to think about the birds that migrate, and the birds who change their habitat to survive. Being part of the place you live in is so much more important than the accent you speak in.